Japan - the triumph of taste in dishes with chicken. They are very tasty chicken kebabs and easy to prepare. Perfect for an outdoor grill. 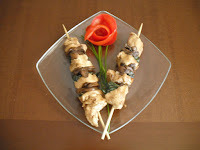 The peculiarity of this recipe is the sauce that serves both to marinate while preparing the chicken, either brush the skewers during cooking. Among its ingredients are: soy sauce, sake and Mirin wine. Mirin wine is slightly sweet wine that comes from fermented rice. Used for cooking, and is the basis for many Japanese dishes. If you can not find it, you can replace it with a semi-dry white wine or sherry. Cut the chicken into cubes. In a small saucepan, warm the sake, wine, soy sauce, sugar and water. When the mixture is hot, remove from heat and let the marinade cool. Pour 2/3 of the sauce on the chicken cubes. Place in refrigerator for at least 30 minutes. Meanwhile, preheat grill or barbecue. Cut the tails of green onions or shallots diagonally to 3 cm in length (or 6 cm and fold into two parts, when they are placed on sticks, wooden skewers) and mushroom into 4 pieces. Put in a pan a little olive oil and cook the mushrooms per10 minutes, adding a little water if necessary. Season with salt. Turn off the heat and let cool. Take a cube of chicken, put on sticks, wooden skewers. Then continue with a piece of onion, a few pieces of cooked mushrooms and, finally, a cube of chicken last. Alternate ingredients to fill the skewer. Grilling the skewers for 5 minutes per side. Using a pastry brush, brush the kebabs with the remaining marinade (1/3 from left above) and serve.